It is common to use anesthesia as an aid during surgical operations, to prevent the patients from feeling any pain. The anesthesia trolley used in the hospitals today is mainly designed to organize the anesthesia tools systematically and to maintain them over a period of time, offering its services to the patients as and when the anesthesia care is required. In order to make the operation successful, and to make the patient unconscious, all the equipments of anesthesia should be kept handy, under complete care and at one place. Anesthesia trolleys are specially designed to give access to all the medical tools at one point during surgeries and operations. The anesthesia trolleys help the medical staff in enhancing their efficiency during busy hours by allowing easy access to the required anaesthetic tools, either to make the patient unconscious or to take some patient out of anesthesia without further delay. Highly hygiene trolleys have compact sized locking drawers with smoother sliding to avoid any displacement. The trolleys can be proficiently moved between passages, rooms and operation theatres due to its light weight structure, flexible movement and stable base which prevent any tripping during transportation. The smooth push-handle with powerful grip controls the movement of the trolley during the emergency situations or the rush hours of the hospital. 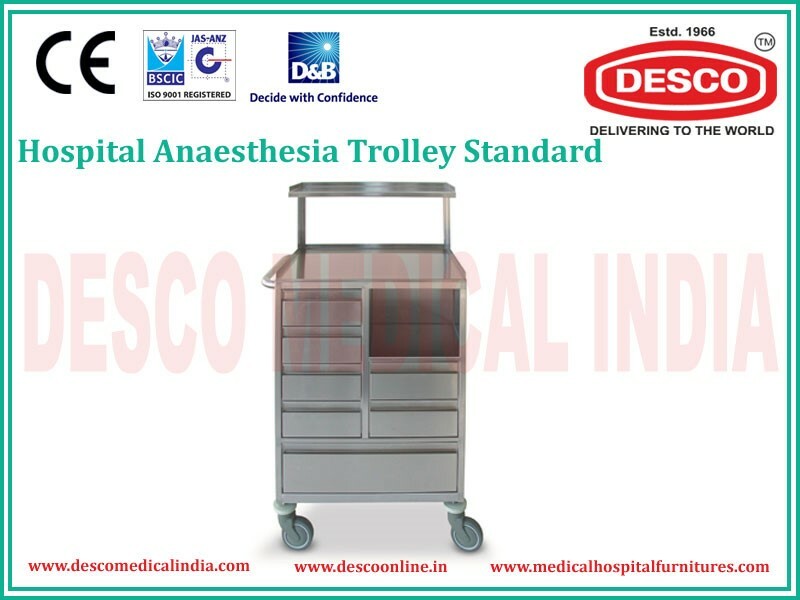 The anesthesia trolleys are in demand today and the manufacturing company Desco India makes the stainless steel trolleys available not only in different sizes but also in different colours, which helps in identifying the trolleys which belong to various departments and sections in the hospitals.